Did you know that if you looked around for long enough on the web you'd eventually find fabulous mobile tools that will boost your LinkedIn productivity and prospects? Well now you don't have to go looking - I've found 5 fabulous LinkedIn apps for you and they're FREE. 1. HeronBiz - Professional finder - Location Based. 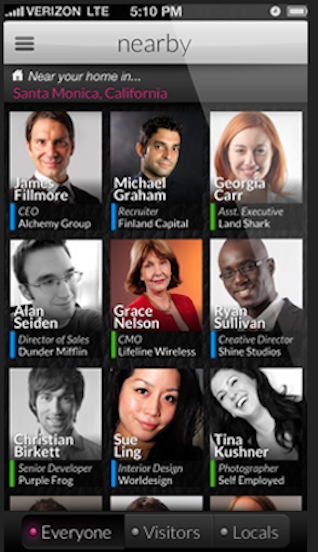 What it does: Location aware, professional networking app (IOS devices only). "We identify the most valuable professionals to you and alert you when they are near." Sidesteps privacy concerns by only showing people in your approximate proximity who are directly connected or with similar industry/job title to the you. The 2 scrappy start-up Founders Allen Hartwig and Nick Smoot are signing up large organizations (American MENSA, Women In Technology, the Association for Corporate Growth LA) in an attempt to ramp up large scale use of the app. A lot of people need to be using it to be truly useful. I found 23 people near me when I tested it. Doesn't sound like a lot but that's 23 more than I knew about, prior to using this app. Enormous potential. Has a secure chat feature. This functionality should have been built into LinkedIn's mobile app from the get go. It's a no-brainer for anyone with a LinkedIn account wishing to network face to face. 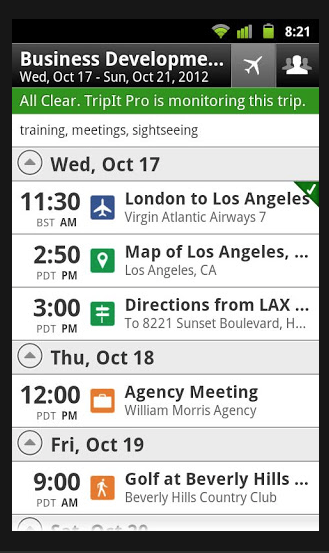 What it does: Links your Tripit account with your LinkedIn account and then automatically shares your upcoming travel plans in your LinkedIn Update stream. Why is this is a good thing? By alerting your network to an impending visit to their neck of the woods, you increase engagement, opportunity and discovery. MyTravel LinkedIn app was launched in 2008. According to the statistics shared by TripIt, 53% of its users visit LinkedIn at least once a week." There are IOS, Android, Blackberry & Windows 7 mobile versions. If you travel and you're on LinkedIn, you should be using this. 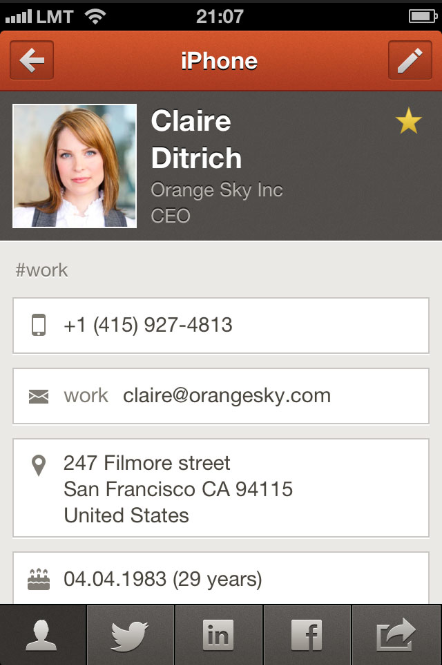 What it does: Scans business cards using your iPhone's camera (Android version apparently in the works), recognizes that person and syncs with their LinkedIn Profile. Not only do you get a digital copy of that person's card, you also get their LinkedIn profile, the option to connect, see their connections and an indication of who you have in common. You can share that electronic version of the card with whoever you like and email your new contact directly from the app. 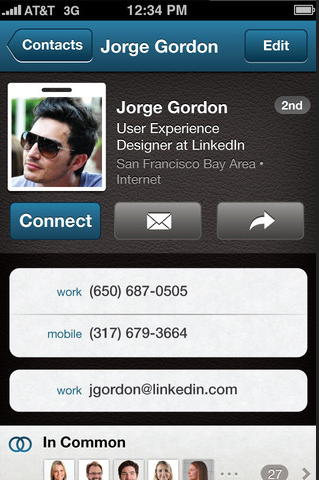 What it does: Unified address book for IOS devices (and Macs) which currently does not officially support LinkedIn integration (something to do with the LinkedIn API and 'low quotas') but there's a workaround - just shake your device in Settings mode and your LinkedIn contacts will appear, like magic. You need to give the app access to your Twitter, Facebook and LinkedIn accounts for it to do its thing. What it does: Another unified address book which scans Gmail, iCloud, Yahoo!, Outlook, LinkedIn, Twitter, and Facebook (but not Hotmail) for the entire social footprint of your contacts. 3 main tabs: 'Profile' 'History' and 'Common'. 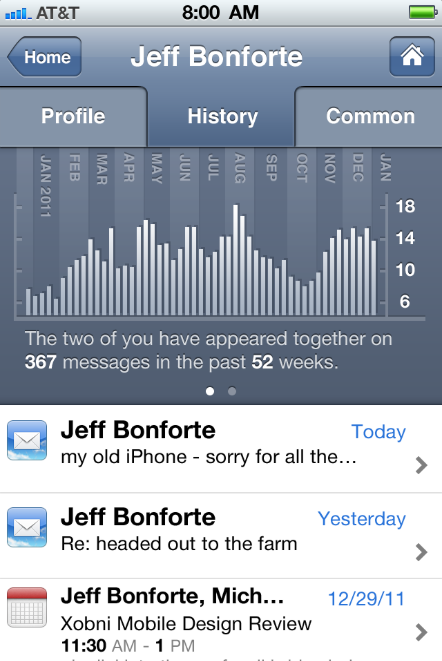 History is a neat view - it shows you the frequency with which you've interacted via email. Common shows those folks you have, in common. Works with Gmail, Outlook, Android & iPhone. Intelligent aggregator with history. I also came across an app that would suit the adventurous lunch crowd. LunchMeet basically broadcasts your willingness to "do lunch" to other LinkedIn users with the same app. It didn't make the cut because for reasons unclear to me, its only available on the Canadian iTunes store. As always - thanks very much for stopping by and reading. If you found this article thought-provoking, interesting or dare I say, useful. Please go ahead and share it with someone using the share buttons.